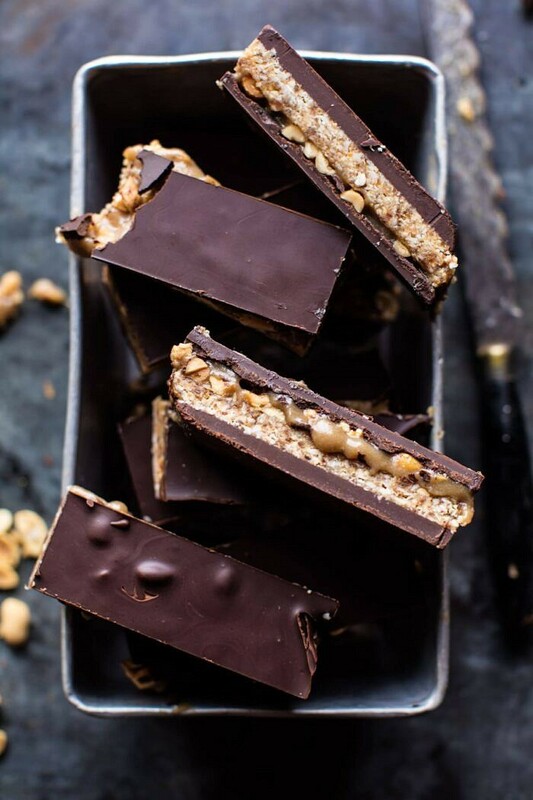 Truly nothing better on a Friday than these no bake Vegan Gooey Chocolate Coconut Caramel Bars. Layered in order with chocolate, nutty coconut, sweet creamy “caramel”, and topped with another layer of chocolate. Four layers of pure vegan dessert heaven. 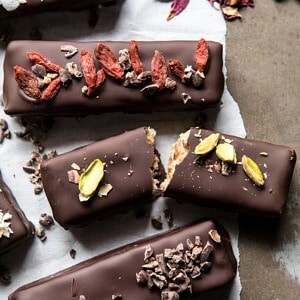 Super decadent…yes, but yet still on the healthy…ish side, and 100% vegan – so delicious. 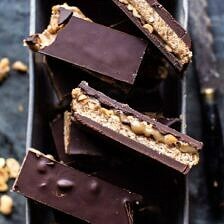 Think of these as your vegan Snickers bar! Well, what’s not to love here? Coconut, chocolate, and caramel, all of my favorites. These bars are true decadence, but yet they’re not completely horrible for us either. I mean, don’t get me wrong, these are not a health food bar, but I think as far as desserts go, they’re actually on the healthy…ish side. I don’t know, maybe that’s just me, but I’m going with it, because Friday’s need chocolate. Anyway, happiest Friday guys! Hope you’ve enjoyed your week and are looking forward to a spring time weekend ahead. I’m in the final stretch of this “big” deadline that I’ve been non-stop talking about for the past two weeks. Very excited to finally be finishing it up and shifting my focus back to brand new blog content and fun Instagram stories. It’s been a crazy schedule, but I’m looking forward to some down time. And maybe even some time in the sun this April…which crazily enough is right around the corner. Alright, so some of you may recognize these bars. They come from the HBH Cookbook and yes, they are mouth wateringly delicious, I mean like, every single bite! I remember back to when I first made these bars and being SO beyond excited about them. In fact I actually debated where to publish these. I almost posted them onto the blog. Waiting for the recipe to be published in the cookbook just seemed like way too long to make you guys wait. In the end I decided the recipe was cookbook material. As excited as I was to share these bars with you all, it would be worth the wait to have them published in the book, where hopefully, they would be seen for years to come. And so, into the book they went. And now, onto they blog they will also go, YEAH! Let me break the deliciousness down for you. Layer 1: slightly sweet dark chocolate + creamy peanut butter. This is the base of the bar, and helps to hold everything in place. I like to mix peanut butter into the chocolate. This helps keep the chocolate soft and makes the bars easier to cut into. Of course, it’s also tastes delicious! Layer 2: coconut + roasted cashews + dates. If these were real Snickers bars, this would be the nougat layer. Honestly though? This combo is better than a traditional nougat layer. It’s sweet, slightly coconutty, and has just the right amount of chewiness. And the best part? It’s not full of ingredients you can’t pronounce. 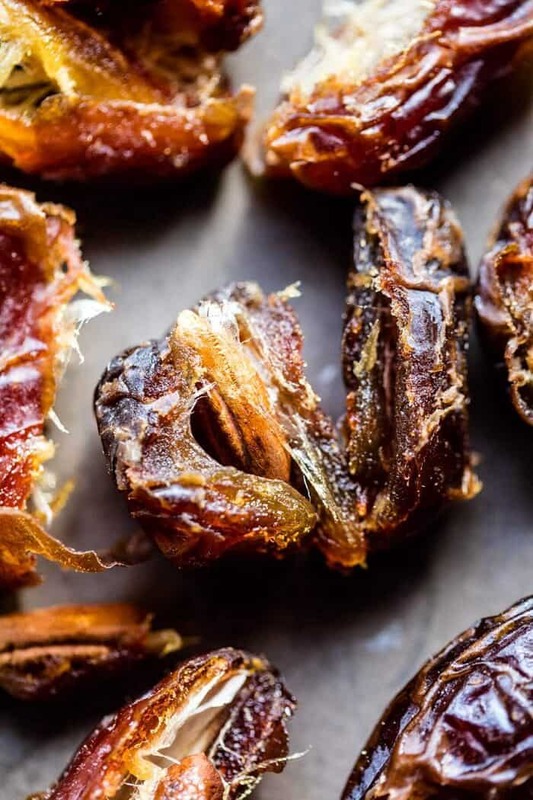 Just unsweetened coconut, cashews, and dates. Layer 4: coconut milk + brown sugar + honey + peanuts + vanilla. The coconut caramel layer! Oh this layer, it’s perfection in every which way. Creamy, sweet, hinted with vanilla and studded with peanuts. Delish. Compare to the crunchy caramel layer in real Snickers…but again, (in my opinion) so much better! Also, if you’re ok with a little less sweet bar, you can omit the brown sugar. This will make these completely free of added sugars (other than the honey). I find these bars plenty sweet enough without the brown sugar. Your choice, simply adjust according to your taste and sweetness preference. Layer 5: chocolate + creamy peanut butter. To really seal the deal…and lock in all the layers. Before you set out to make these bars, you should know this. The caramel is never going to firm up like a traditional caramel bar—it will always be gooey, runny, and all kinds of delicious! Therefore, I recommend storing the bars in the fridge at all times. When ready to serve, remove, and eat promptly. This will avoid additional messiness. Just be sure to lick your fingers clean of all the luscious caramel and chocolate. Oh, and seeing as these bars are reasonably healthy ( . . . ish), I’m thinking they could be cool for breakfast too! Okay, that may be a bit of a stretch . . .
Have the BEST Friday. See y’all Sunday! 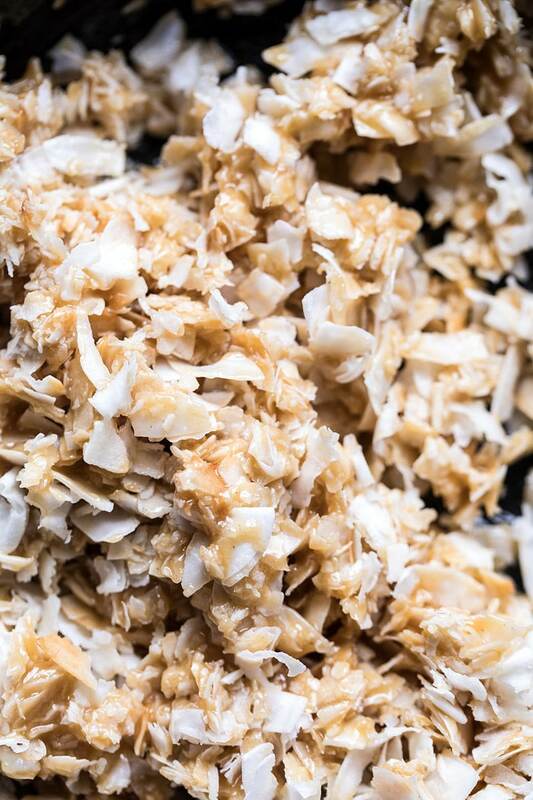 If you make these coconut bars, be sure to leave a comment and/or give this recipe a rating! Above all, I love to hear from you guys and always do my best to respond to each and every comment. And of course, if you do make this recipe, don’t forget to also tag me on Instagram! Looking through the photos of recipes you all have made is my favorite! Layered in order with chocolate, nutty coconut, sweet creamy "caramel", and topped with another layer of chocolate. Four layers of pure vegan dessert heaven. 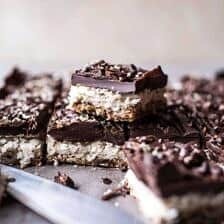 No bake, 100% vegan, and so delicious! 1. Line a 9 x 13-inch baking dish with parchment paper. 2. Melt together 6 ounces of the chocolate and 2 rounded tablespoons of the peanut butter in the microwave until melted and smooth. Pour into the prepared baking dish and spread into an even layer. Place in the freezer for 15 minutes to harden. 3. Meanwhile, in a food processor, pulse the coconut flakes and cashews until finely ground. Add the dates and pulse until the mixture comes together and forms a ball. 4. When the chocolate–peanut butter mixture has hardened, remove the pan from the freezer and, using your hands, press the coconut mixture into an even layer on top of the chocolate. Return the pan to the fridge to chill while you make the third layer. 5. In a medium saucepan, combine the coconut milk, sugar, and honey. Bring the mixture to a boil over medium-high heat. Cook for 10 minutes, or until the caramel has thickened. Remove the pan from the heat and let cool for 5 minutes, then stir in the coconut oil, vanilla, and peanuts. Remove the pan from the fridge and pour the caramel mixture over the bars, spreading it in an even layer. Return the pan to fridge to chill for at least 1 hour. 6. About 10 minutes before you remove the bars from the fridge, melt together the remaining 6 ounces chocolate and remaining 2 tablespoons peanut butter in the microwave until melted and smooth. Let cool for 5 minutes, then pour the chocolate over the caramel layer, spreading it into one even layer. Return the bars to the fridge until well chilled, at least 1 hour. 7. Cut the bars into squares before serving. Store in the fridge for up to 1 week. *If you want to omit the brown sugar and make these completely free of added sugars, you can definitely do so. I find these plenty sweet enough minus the brown sugar, but adjust according to your taste and sweetness preference. 7-Layer Dulce De Leche Oatmeal Chocolate Chip Bars. These look truly so delicious! Wow! I can’t wait to give them a try! These bars looks like the perfect treat indeed. Will probably give them a try soon and omit the brown sugar as you suggested. I love naturally sweetened sweets. Oh! My! Goodness! 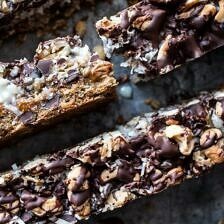 Every layer of these bars is full of decadent deliciousness! 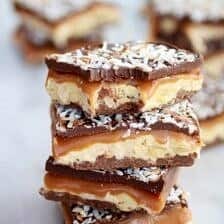 I’ve been craving chocolate like crazy lately and I’m thinking your chocolate coconut caramel bars are gonna do the trick for me. And Just in time for the weekend. As always, thanks for sharing!! Any sub for the honey? Have you tried agave for the honey to make these vegan? These are all my favorite flavors, in one delicious little treat. Can’t wait to try it! Wow can’t wait to try the recipe. That caramel looks absolutely amazing!! Could you use almond or cashew butter instead? For those vegans who don’t use honey, have you tried Agave? Super sweet and delicious. I love it. My favourite recipe at the moment is salmon pan seared in olive oil, then sloshed with Agave, finely chopped ginger and thinly sliced spring onion. Agave also has the advantage of being low glycemic, I use it occassionaly for my hubby who is diabetic. Tieghan, These sound soooooo good, only problem I hate flaked coconut. I’m ok with the coconut milk. Is there anything to sub in for the coconut or just do the recipe without it. Any suggestions would be appreciated.